"Hawks huddled disgruntled against hissing snow. Wrens in winter thickets. Swallows carving and swimming and slicing fat grinning summer air. Frozen dew outlining every single blade of grass. Salmonberries blackberries thimbleberries raspberries cloudberries snowberries strawberries blueberries gooseberries. My children learning to read. The sinuous liquid flow of rivers and minks and cats. Fresh bread with waaaaaaay too much butter. My children’s hands when they cup my ancient grizzled face in their hands. Exuberance and ebullience. Tears of sorrow which are the salt sea of the heart. Sleep in every form from doze to bone-weary. The shivering ache of a saxophone and the yearning of an oboe. Folding laundry hot from the dryer. Cobblers and tailors. A spotless kitchen floor. The way horses smell in spring. Postcards on which the sender has written so much that he or she can barely squeeze in a signature. Opera on the radio. Toothbrushes. The postman’s grin. The green sifting powdery snow of cedar pollen on my porch every year. The way a heron labors through the sky with such vast elderly dignity. People who care about hubcaps. The cheerful ears of dogs. All photographs of every sort. Tip-jars. Wineglasses. The way barbers sweep up circles of hair after haircuts. Handkerchiefs. Libraries. Poems read aloud by older poets. Fedoras. Excellent knives. The very idea of albatrosses. Thesaurii. The tiny screws that hold spectacles together. Book marginalia done with the lightest possible pencil. People who keep dead languages alive. Wooden rulers. Fresh-mown lawns. First-basemen’s mitts. Dishracks. The way my sons smell after their baths. The moons of Jupiter, especially Io. All manner of boats. The fact that our species produced Edmund Burke. Naps of every size. Junior Policemen badges. Walrussssses. Cassocks and surplices. The orphaned caps of long-lost pens. Welcome-mats and ice-cream trucks. All manner of bees. Cabbages and kings. Eulogy and elegy and puppetry. Fingernail-clippers. The rigging of sailing ships. Ironing-boards. Hoes and scythes. The mysterious clips that girls wear in their hair. Boddhisatvas and beauticians. Porters and portmanteaus. Camas and canvas. Bass and bluefish. Furriers and farriers. Trout and grout. Peach pies of any size. The sprawling porches of old hotels and the old men who sprawl upon them. The snoring of children. The burble of owls. The sound of my daughter typing her papers for school in the other room. The sound of my sons wrangling and wrestling and howling and yowling. All sounds of whatever tone and tenor issuing from my children. My children, and all other forms of coupled pain and joy; which is to say everything alive; which is to say all prayers; which is what I just did." Listen to Brian Doyle on OPB's Think Out Loud. Watch and listen to Brian Doyle at a Mink River reading. Every year, two longstanding Portland festivals shine a bright light on two subjects that are well-loved at OSU Press—natural history and Northwest history. This year, as always, OSU Press authors will be in good supply at the Wild Arts Festival and OHS's Holiday Cheer. At th e 31st Wild Arts Festival, which takes place Saturday, November 19 and Sunday, November 20, attendees can meet regionally and nationally known artists and writers, including OSU Press authors Robin Cody, Mike Houck and M.J. Cody, Brian Doyle, Marcy Houle, Bart King, Robert Michael Pyle, Barbara Roberts, Noah Strycker, William L. Sullivan, and Ellen Waterston. Of special note: the official launch of the new edition of Wild in the City! The 44th Holiday Cheer, the Oregon Historical Society's celebration of Oregon authors, happens on Sunday, December 4. This year attendees can purchase a ticket to attend a special event with Jean Auel in addition to meeting all the attending authors at the main event. From OSU Press, look for Carl Abbott, C. Melvin Aikens, Avel Louise Gordly and Patricia Schechter, Michael C. Houck and M.J. Cody, Bart King, Barbara Roberts, and William L. Sullivan. These well-loved events mark the season of gift-giving in Portland—they are definitely worth a visit! Wild Arts Festival. November 19, 10 a.m. to 6 p.m. and November 20, 11 a.m. to 5 p.m. Montgomery Park, 2701 NW Vaughn, Portland. Join them on Facebook. OHS's Holiday Cheer. December 4, Noon to 5 p.m. Oregon Historical Society, 1200 SW Park Avenue, Portland. Join them on Facebook. This week Portland Parks & Recreation learned that it won the National Gold Medal Award, the highest honor a park system can attain. By coincidence, this week also sees the release of Wild in the City, a new edition of the definitive guide to the Portland-Vancouver region’s gold medal parks, trails, and greenspaces. In an editorial marking the two accomplishments, The Oregonian notes that the original edition of Wild in the City, published in 2000, was “groundbreaking in its chronicle of wildlife in the region. 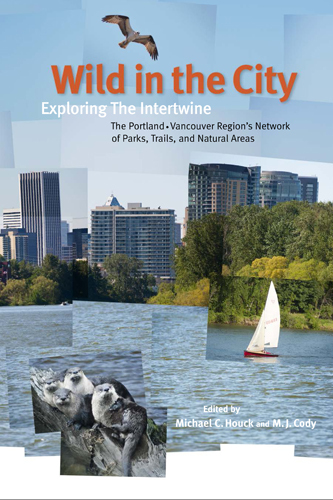 The revised and updated edition of Wild in the City features over 90 sites guides, natural history essays, and nature “rambles” by foot, bike, and boat. More than 100 writers and artists donated their time and expertise to the volume, ranging from local naturalists to nationally renowned authors such as Richard Louv, Ursula Le Guin, and Robert Michael Pyle. 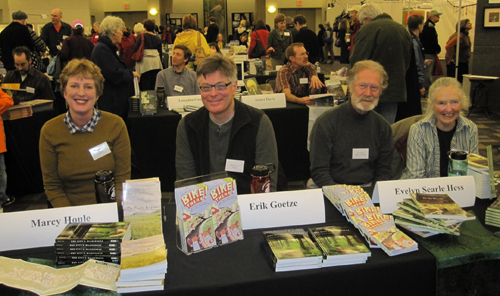 The creative team behind the book, co-published by OSU Press and the Audubon Society of Portland, included Bob Sallinger, Martha Gannett, Rafael Gutierrez, Bob Wilson, and editors Mike Houck and MJ Cody. This new edition of Wild in the City was made necessary in part by the rapid expansion of natural areas in the Portland-Vancouver metropolitan region—places like Cooper Mountain and Graham Oaks were not open to the public when the book was first published. The new subtitle, Exploring the Intertwine, reflects the name that has been bestowed upon the interconnected system of parks, trails, and natural areas that span the region. The official launch of Wild in the City takes place at the Wild Arts Festival, November 19 and 20 at Montgomery Park in Portland. The editors, members of the creative team, and several of the contributing authors will be on hand to discuss the book and sign copies.